Last weekend I spent a whirlwind 48 hours in San Diego. My first stop on Friday morning was Evergreen Nursery, a wholesale grower open to the public. The company has three locations: San Diego proper, Oceanside, and El Cajon. 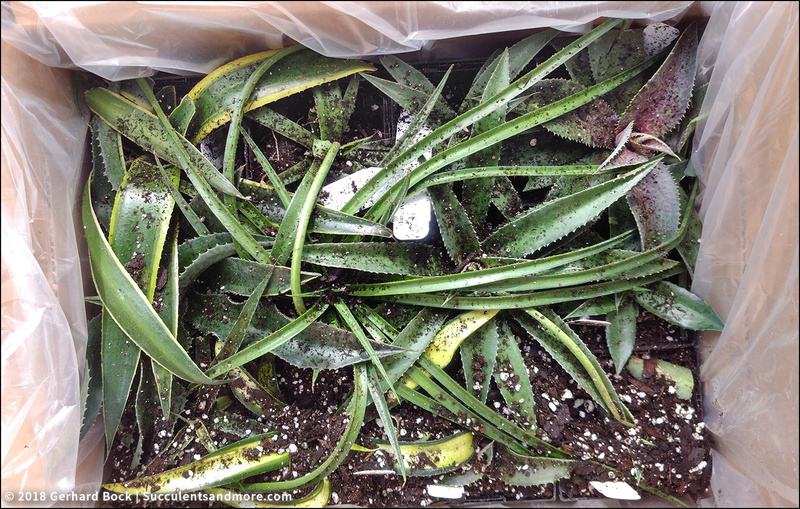 The El Cajon location was holding an Aloe ortholopha for me, so that's where I was headed. Evergreen Nursery is right off Interstate 8 northeast of town. Surrounded by hillsides, green at this time of year, the rural location is beautiful. 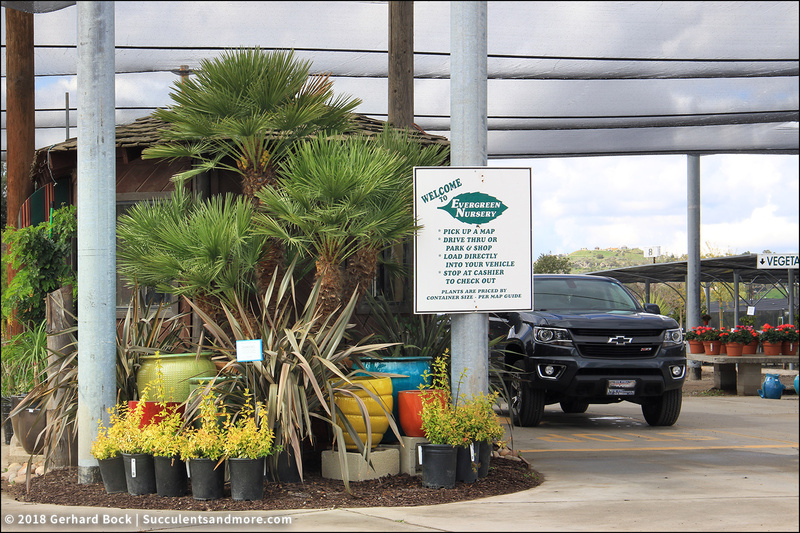 What makes Evergreen Nursery so special is that it's a drive-through nursery. That was definitely a first for me. This is how the company explains the "Evergreen System:"
Evergreen's pricing system is designed for your ease and convenience. Plants are priced by the container size. The plants are color coded (the color code is on the map). While driving, the customer can look at a field of one gallon shrubs and easily see the least expensive (yellow card) varieties and read the plant's description. I know I do crazy things now and then. Last weekend ranks right up there. I flew to San Diego from Sacramento early on Friday morning (flight time is only 1:20 hr), went to the Succulent Celebration at Waterwise Botanicals; toured one of the most beautiful private succulent gardens I've ever seen; explored Rancho Soledad Nursery, the source of many popular agaves like 'Blue Glow' and 'Blue Flame'; met up with some fellow succulent fanatics at the Succulent Cafe; and checked out Jeff Moore's nursery Solana Succulents. I arrived back home at midnight on Saturday. 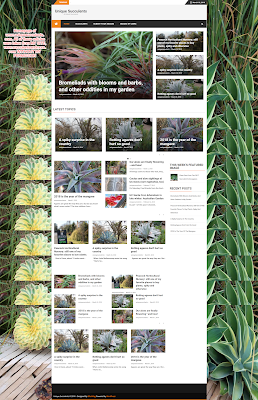 48 hours of total succulent madness! I took over 900 photos, so it'll take me a while to go through them all. Here are a few collages to give you an idea of what I saw. 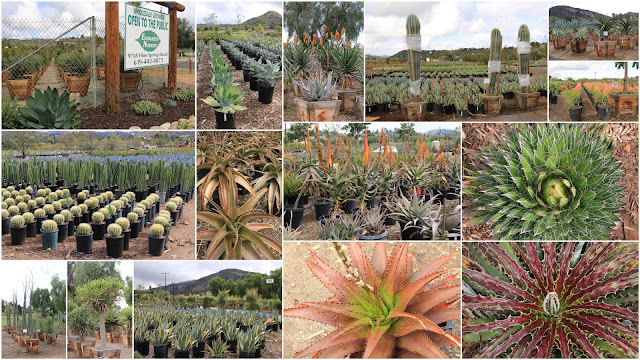 My very first stop was at Evergreen Nursery in El Cajon, east of San Diego. They were holding a hard-to-find Aloe ortholopha for me. 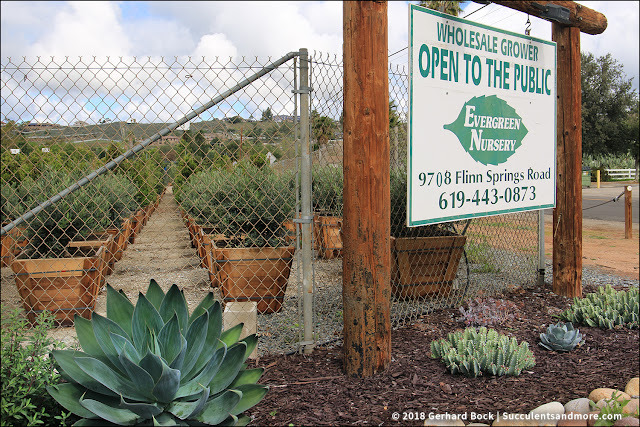 Evergreen Nursery is a wholesale-but-open-to-the-public nursery with three locations in the San Diego area. Their prices are extremely reasonable (my 5-gallon aloe was $24.50). 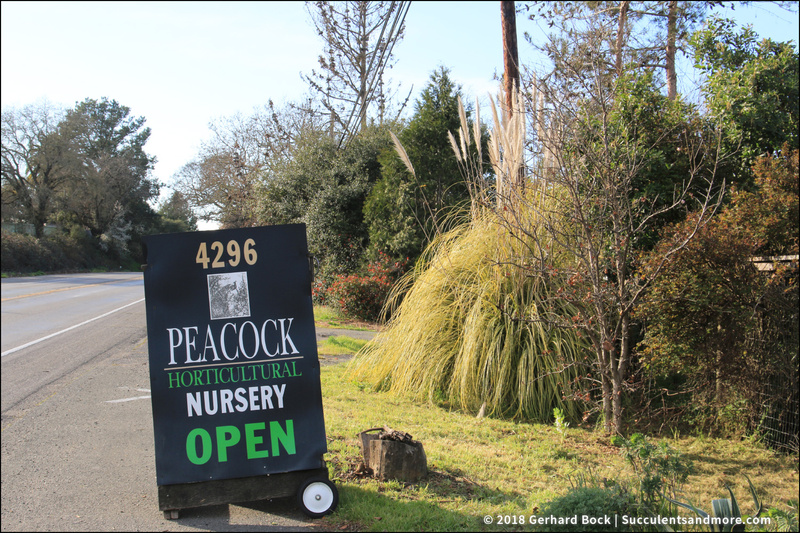 But the most interesting thing about Evergreen: It's a drive-through nursery. You drive through the entire nursery (some 30 acres) in your own car, load up the plants you want, and on the way out you stop at a kiosk where they tally up your purchases. I'd never experienced anything like it before. Waterwise Botanicals, a 20-acre succulent nursery in northern San Diego County, is the place to be this Friday and Saturday, March 23 and 24, 2018. 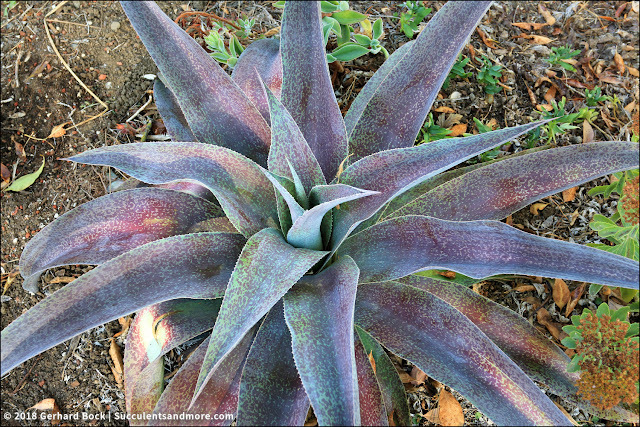 Themed "A Walk on the Wild Side," Waterwise Botanicals' 2018 Super Succulent Celebration is a two-day event packed with presentations, demonstrations, and workshops for succulent lovers. Vendors include master potter Susan Aach whose creations complement succulents perfectly. Cacti, agaves, yuccas and their kinfolk may have been around the longest in our garden, but they're not the only spiky residents. More recently, they've been joined by members of a different family: bromeliads. These aren't succulents, but they're just as alluring. 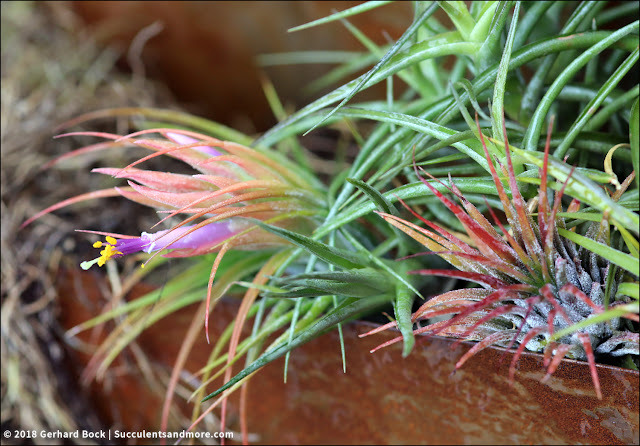 While some bromeliads have armaments as fierce as those of cacti or agaves, others are very user-friendly—especially tillandsias, the much-beloved air plants that have conquered by the world by storm in recent years. My first tillandsia experience about 10 years ago didn't have a happy ending, but I learned a valuable lesson: air plants can't live off air alone; they do need water. My current crop of tillandsias, acquired in January, lives outside in metal wall planters, and I mist them once a week (or rather, I try to). Whatever I'm doing must agree with them, because to my shock and surprise, one of them is actually flowering! This may not be a big deal to people who have more experience with tillandsias than I do, but I still think it's a minor miracle. On Saturday I had the opportunity to revisit one of my favorite nurseries: Peacock Horticultural Nursery in Sebastopol, Sonoma County. If traffic is smooth, it's a 90-minute drive from Davis—unfortunately, not close enough to go as often as I'd like. 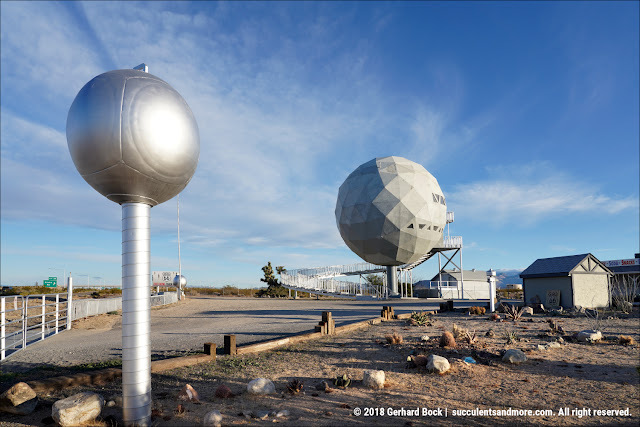 But as you can see in this image-heavy post, it's such a special place that I've vowed to return soon. Peacock Horticultural Nursery is owned by Robert Peacock (hence the name) and Marty Waldron. 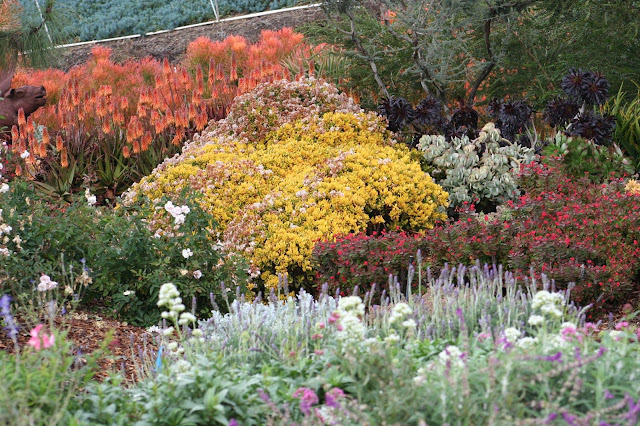 It's the kind of nursery that has become rare in this age of big box stores and garden centers: a place run by true plant lovers—plant nerds, you might say—where plants are front and center. And I'm not talking about the few dozen mainstream plants you find at Lowe's, Home Depot and OSH. What PHN carries is the antithesis of that. Or, as I like to say, the antidote. The 80+ photos below are ample proof of that. PHN is not a sterile business in a commercial strip. Instead, it's literally Robert's and Marty's front and backyard (they live in the house right by the entrance). It just happens to be full of plants you can buy. The fact that many of them are unusual or rare makes the experience even sweeter. 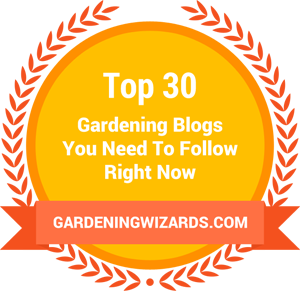 If you like exploring and finding plants you never even knew existed, this is the place for you! I live in Davis, about 15 miles west of Sacramento, the capital of California. Our town of 65,000 is surrounded by a flood plain to the east and agricultural land everywhere else. As soon you leave the city limits, you're in the country. This fact became very clear when I visited Three Palms Nursery. Located about 7 miles west of downtown Davis, the nursery is located all by its lonesome in the middle of fields. A peaceful and bucolic spot indeed. But the topic of this post isn't Three Palms Nursery although I'm planning a return trip later in the month. Rather, I want to you show you what I found on the way home. Just before you enter Davis proper, there's an empty lot at the intersection of two county roads. Except it's not exactly empty. True, there's no house on it, but somebody has been using it as their desert garden. 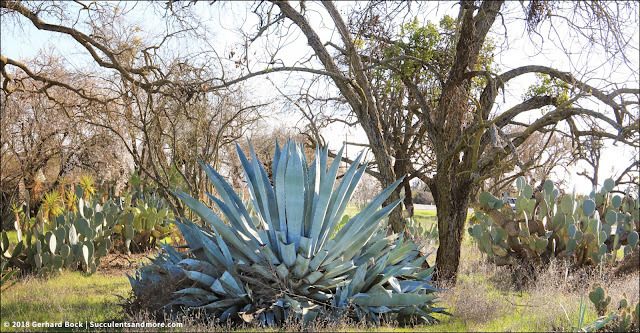 It's conceivable that some of the Agave americana and prickly pears appeared on their own—they do naturalize around here. But the other assorted cacti were definitely added by a human. When John Mellencamp wrote his song "Hurts So Good," he definitely wasn't thinking of two of his favorite agaves rotting away. That, my friends, does not hurt so good. In fact, it hurts quite bad. 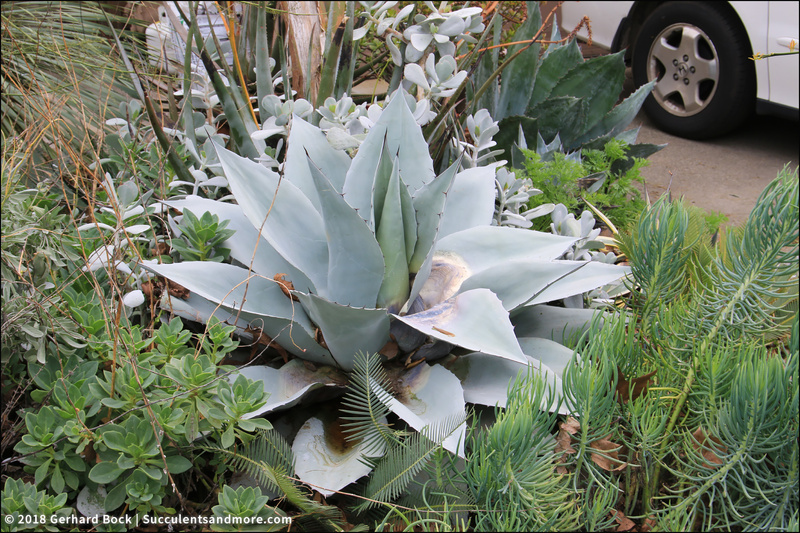 Both agaves are next to each other in the same bed along the driveway. And a third one in the same bed is showing signs of rot, too. Let's take a look. Be sure to grab a Kleenex. Agave #1 is a beautiful specimen of Agave ovatifolia 'Frosty Blue'. It's nowhere near its adult size yet, but it has such a great presence.